Because it’s Monday and I’d like to start my month better than before, I am blogging about not just productivity but HIGHER PRODUCTIVITY. Each year that is added to my life, it has always been my mission to change myself for the better. This applies not just in my personal life but in all aspects of my life in general. Actually, improving myself has always been one of the major driving forces why I do the things I do each and every day. It’s the reason why I took up Psychology back in college, why I like reading about self-help stuff, why I’ve set up this self-help section on this blog in the first place. However, one thing that I keep noticing all these years when it comes to wanting to achieve bigger things in my life is that I easily get distracted with seemingly important matters at hand and before I know it, another year has passed and my life has once again been filled with doing exciting and urgent stuff that don’t really bring me the kind of value that I want nor pay me huge dividends in the long run. When this year started, it was my plan to change that and become more productive. That was why a week after I gave birth in November 2015, I was already attending a $425 internet business marketing course which lasted until the third week of January. Moreover, over the course of this year, I’ve also subscribed to a couple of free coaching programs which I think will help me get the productivity level I want in my life. And because this new blog is not just about documenting my experiences in motherhood and the travels I’ve had, but also about dipping my toes in the world of entrepreneurship, I really have to be as productive as I can be so I can do everything that needs to be done despite the challenges being a new mother bring and set up the business that Mahal and I have been planning for. Do you know that we only have a little willpower during the day and we tend to use it up taking care of urgent matters and other distractions? And before we know it, we’ve already neglected the things that really matter like our health, our relationships, developing our business, or whatever it is that we deem important. I have personally experienced this as my health has been compromised middle of this year which I’ve yet to blog about and which is also why I want to share this here as a reminder that practicing higher productivity can bring about positive results not just in our working life but in our personal life and health as well. 1. Start using our energy each day to build new habits. For example, instead of checking our emails first thing when we wake up, drink water to hydrate ourselves, do some exercise, meditate, then have a super healthy breakfast. This way, we get to have time for ourselves to think what should be on our agenda for the day instead of what everyone else wants us to do. So by the time we’ll start working, we’re already on track for a good healthy day of eating; we are already focused on what must be done for the day that will make us most productive and help us make more money in our business. We are already hitting two birds with one stone here. We get to be a lot healthier and fit and our business gets to be right on track financially. >> I’ve started doing this the moment I found out in July 11, 2016 that I have high blood pressure, high cholesterol, and high blood sugar levels. The changes I’ve made in my lifestyle have tremendously changed my health for the better since then. You can read about the changes in my daily routines which contributed to my better health and better productivity. 2. Dedicate blocks of uninterrupted time working on the key money-making areas of our business (e.g. creating our next products and creating the marketing for them). We can set up a digital timer to help us with this. Put an alarm for one hour and in that period, drop into a “flow state” and just focus on doing one thing, no distractions, no interruptions. When the alarm goes off, stop, drink water, stretch. People who have done this have found out that they have done so much more in this blocked period of time than they have in an entire day full of so many distractions. > I have just started doing this the last week of September 2016 when I vowed to upload one video a day to my Youtube Channel and over the past weekend when I said that I’ll be updating this blog once a day from Monday-Saturday, US time. And every time I’d finish a task, I do 30 seconds of planking and drink my slimming water concoction — water with potato slices, cucumber slices and apple cider vinegar. >>> Another thing I want to block time for is to work on the back-end of my blog and social media networks, start writing eBooks, and review the course I finished early this year. 3. Apply the lesson from Stephen Covey’s Habit #3: Put first things first. You’re probably already familiar with this lesson: Put the biggest rocks in the tank first, then the smaller rocks, then the pebbles, then the sand. This way, everything fits inside the tank as compared to putting the sand first, then the pebbles, then the smaller rocks, then the bigger rocks. It just won’t do. Same way with our business or daily life. Accomplish the most important things first – those that we consider will impact our life and our business the most. Otherwise, other people and circumstances will take our attention and be the ones to decide what we should do with our time and energy. So, we must know what our biggest rocks are and then do them first. >> In this case, motherhood comes first, then my being a life partner to Mahal, then work, then my being a homemaker, then travels and other hobbies.. Opportunity cost is what Warren Buffet takes into consideration when investing. It’s what other things you could be doing with the money instead of investing it in something. If there’s a better place to invest your money into then it doesn’t matter what the price of the money or the risk is because there’s something better we could be doing with our money. Use this opportunity cost mindset to bolster our productivity. Like when we ask ourselves if there is something better that we could be investing our money in, the opportunities will start revealing themselves to us. So when we’re choosing which activities to do in our life and business, we shouldn’t just be thinking about the results of the activity but we should think of the results when we focus on doing the highest value activity. So know the value of the activities that we are doing or want to do. What results do they give us in the long-term? This way, we know which ones have the most value and which ones have the least and then we can prioritize according to the results they can give us in the long run. “It’s what you’re doing when you’re not doing what you’re supposed to be doing that’s the problem.” That’s opportunity cost. Look at the image of the pyramid above. At the bottom of the pyramid is the Zero or Negative Value time. This is the time that we spend wasting on things that don’t bring us any value or actually take our energy and attention away from us and give us nothing in return like watching TV, eating junkfood, chatting online about senseless stuff, compulsively checking our social networks or emails, gossiping, etc. On top of that are the Low Dollar Value activities which are things that pay us very little like shopping, checking emails, errands we have to run, etc. Next is High Dollar Value time. These are activities that immediately bring us higher return on our investment like talking to customers, doing sales, working on some marketing copy, getting new marketing partners to sell products for us, etc. 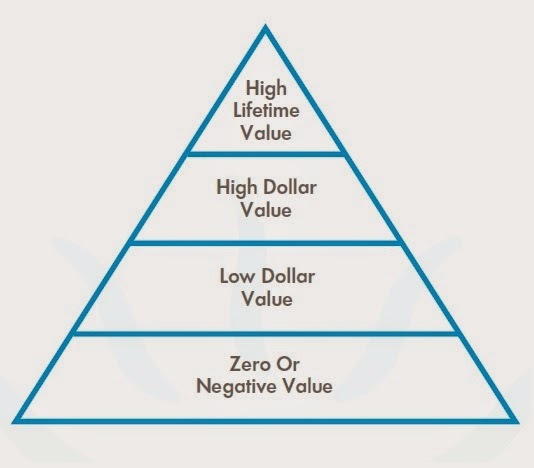 On the highest level of the pyramid is what we call High Lifetime Value. These are activities that pay us for the long-term. They keep paying dividends on and on for years, decades and sometimes even for life. E.g. In business, these are things like working on investing, improving our product, or hiring someone that will help us build our business. On the personal side, these could be things like exercising, getting a new mentor that will help us develop in the next level, learning a new skill set, taking care of our family and relationships, etc. This productivity pyramid will help us identify the activities that will bring us the most value in our life and business. Once we’ve identified these types of activities, we can then prioritize them according to the value they bring starting with those on top of the pyramid. This will start the cycle of bringing us more success, more happiness, more results and higher income which then give us more energy to keep doing the system. By doing these five things, we can help ourselves become more productive starting now. This is actually why I am going to be rearranging my life a bit… discard some old habits and replace them with new ones which I consider of high value to me and will bring me more “dividends”, the kind of value I need in my life in the long run. I hope this post inspires you to reach the productivity level you need in your life right now too. Let us do this exercise regularly to refine and clarify what our highest-value activities are. Let’s do them every day… first thing. Cheers to a more productive you!